The number one tourist attraction in Wheaton, Illinois according to Trip Advisor is Cantigny Park. 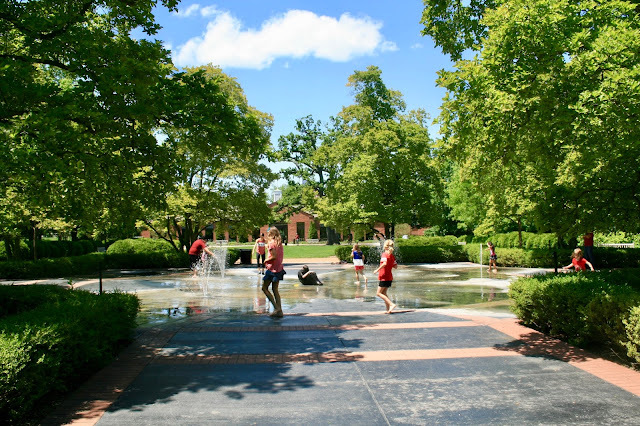 And although I myself was a college student in Wheaton, and twenty some years later my daughter became a college student at Wheaton and later settled there, I had never been to Cantigny Park. Ashley and Jason (my daughter and son-in-law) had been there many times for banquets and performances but they never ventured into the park. The only part they ever saw was the building you see below, because that was where their events were held. But now it was Memorial Day weekend, and we were looking for something patriotic to do. We attended the Wheaton Memorial Day parade in the morning (which was wonderful!) but needed something else to do to fill our day. So I went on Trip Advisor and googled "Things to do in Wheaton, Illinois" and Cantigny Park came up. It said they had a war museum and a tank park in addition to flower gardens. Perfect! What better thing to do on Memorial Day? Unfortunately when we pulled up to the gate to pay our admission we were informed that both the war museum and tank park were closed for renovation. We were so disappointed. That's what my husband was looking forward to seeing the most...especially on Memorial Day! We almost turned our car around and left, but we decided to at least see the gardens, and I am so glad we did! 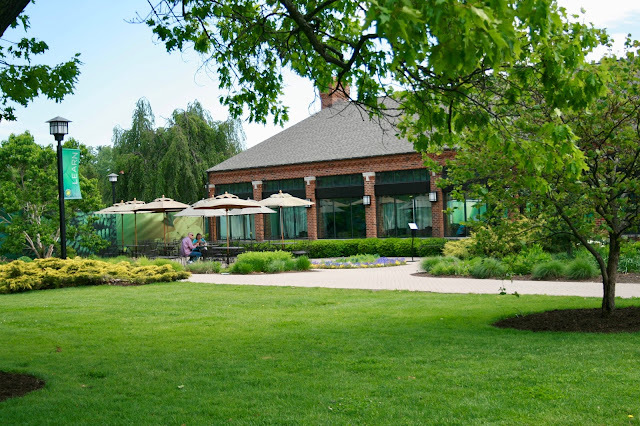 Cantigny Park is a 500 acre park that includes gardens, a 27-hole golf course, a picnic grove, playground (both areas closed as part of five year renovation project), hiking paths, two museums, a tank park, restaurants, and a gift shop. 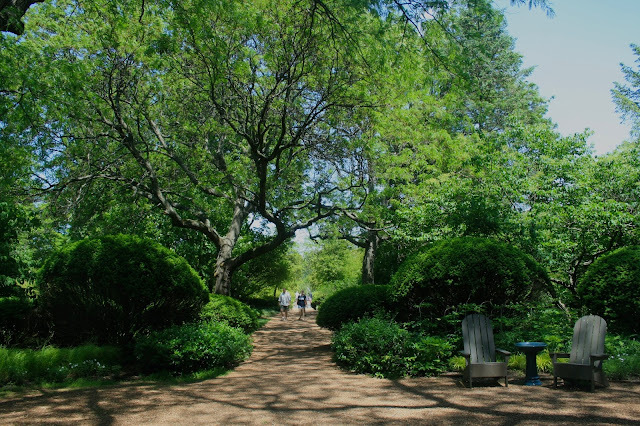 The park is the former estate of Joseph Medill and his grandson Colonel Robert R. McGormick , publishers of The Global Tribune. We did not stop and spend any time at the visitor's center where I later found out there is a short movie you can watch to find out more about the history of the park. 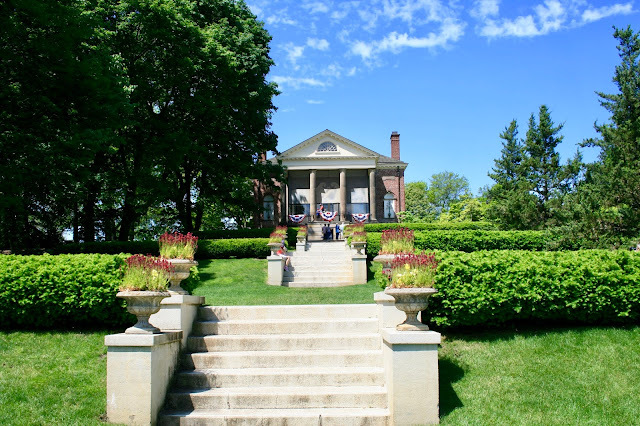 But I did talk to an employee who informed me that there are free tours of the Medill/McGormick mansion. She said tickets are on a first come/first serve basis and that we should hurry there first...so we did! We missed the first tour of the mansion, but we did get tickets for the next tour. No photography was allowed inside the home so unfortunately I can only show you pictures of the outside. The tour began with a movie about the life of the owners and the history of the mansion and property. Then we took an hour long guided tour of the 35 room mansion. We saw three floors, all decorated and filled with artifacts of the time period and/or the family. It was a beautiful home, and I'm so happy we got to see it. 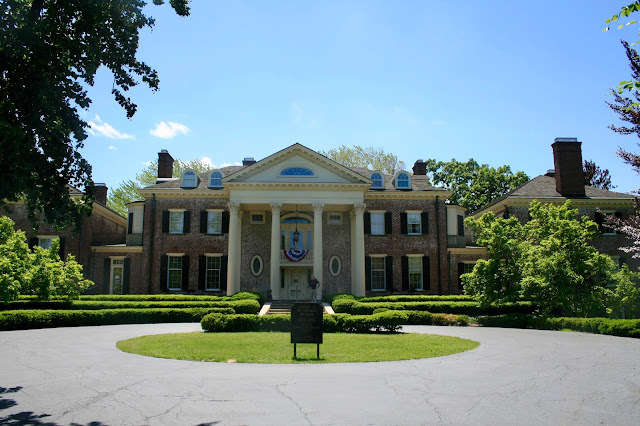 I love to tour historic homes, and this one was very, very informative. 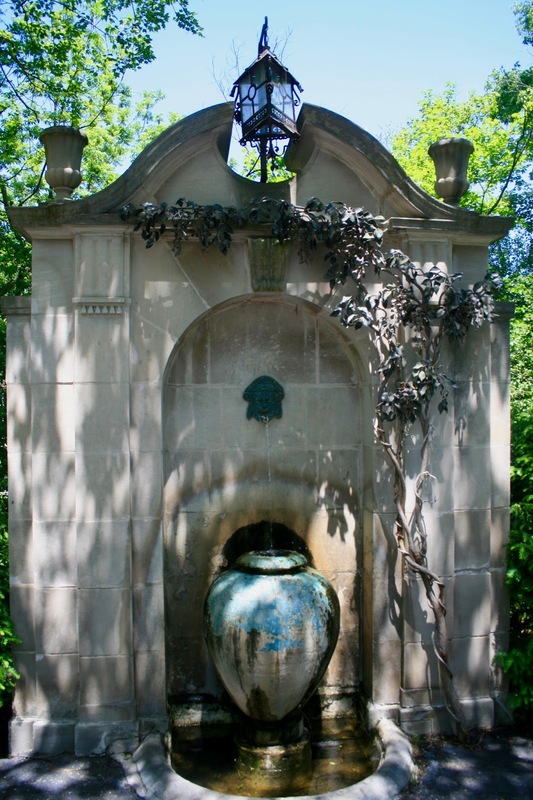 Before the estate was open to the public, there was a long tree lined road that led to the house, and this water feature was located at the end of that street. Before and after the mansion tour, we visited the gardens. 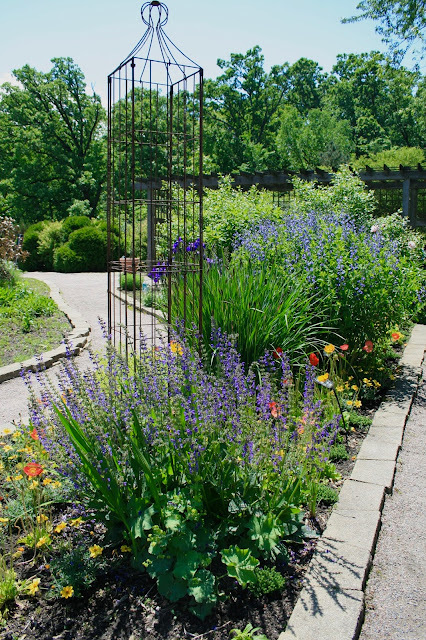 It was late May in Illinois so the gardens were not in full bloom, but there was still plenty of color and interest. 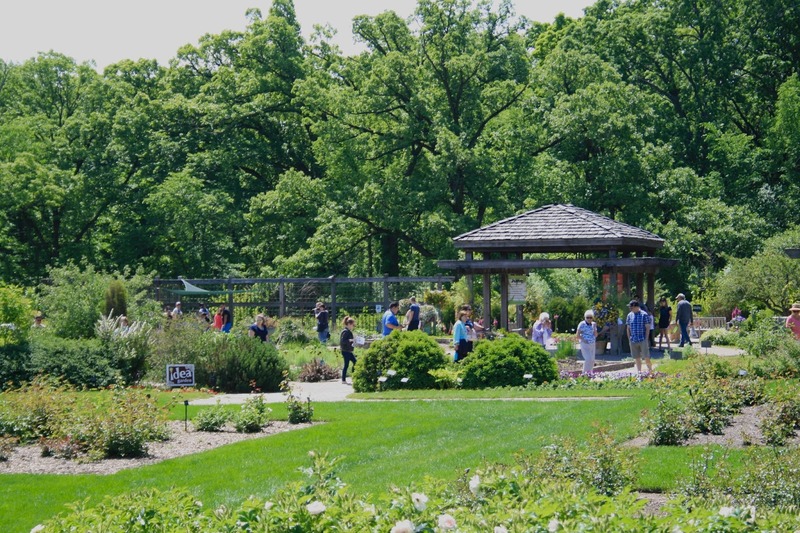 Pictured below is the Rose Garden in the foreground and the Idea Garden in the background. This trio of urns was in the center of the Rose Garden. 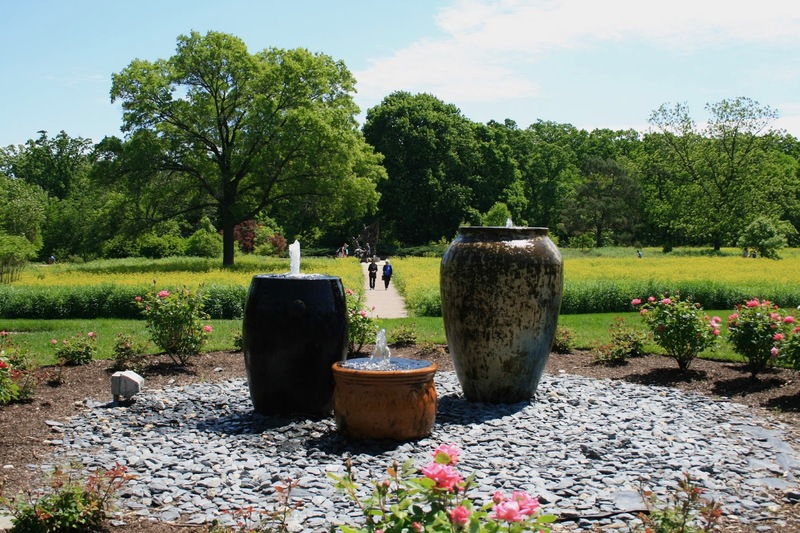 They made the urns into a unique, attractive water feature. 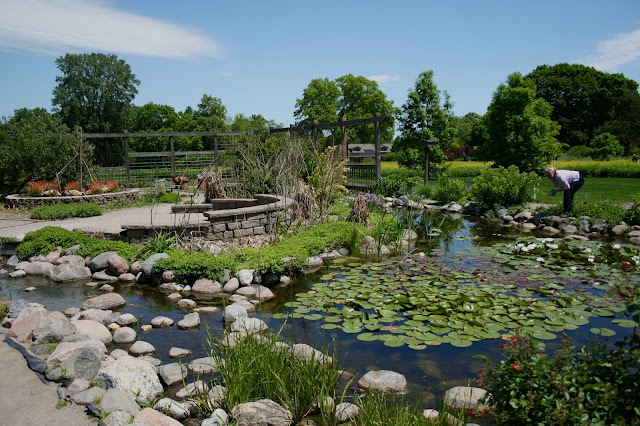 The Prairie Garden can be seen behind the water feature. 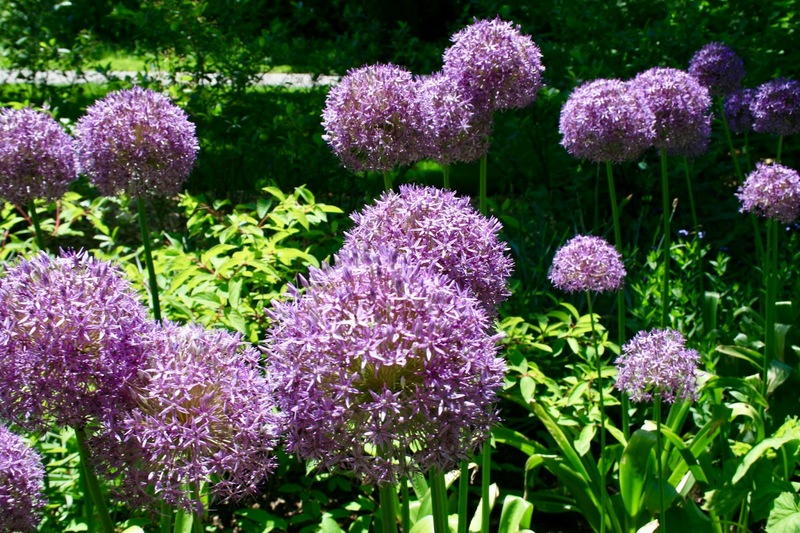 They had the hugest Allium flowers in the Cantigny Gardens. Mine only grow about half this size! The Idea Garden is the place to get...what else? IDEAS for your own garden. I liked the height and interest this metal structure created in this small garden. I also liked the pergola in the background. I've always wanted a pergola in my yard! 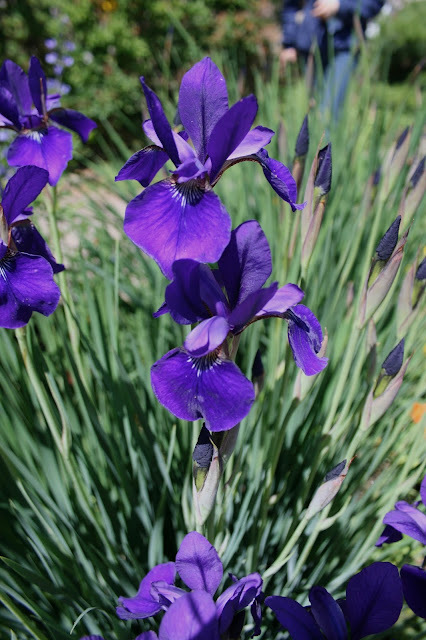 Siberian Iris and Sage were in bloom when we were visiting. In the Idea Garden was a lovely patio sitting area with benches and pretty pots. 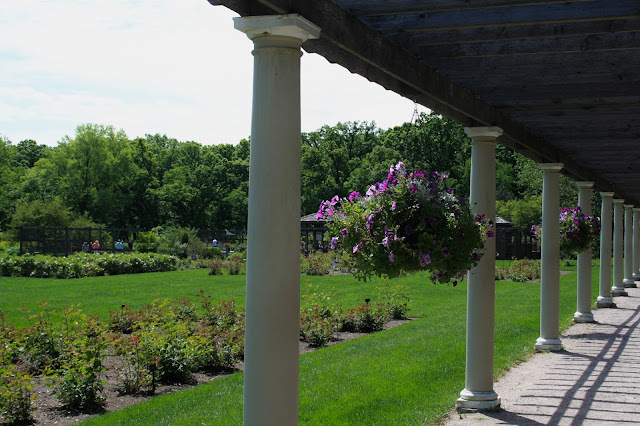 There was a lovely pergola with benches on the edge of the rose garden so visitors could sit in the shade and enjoy the beauty. 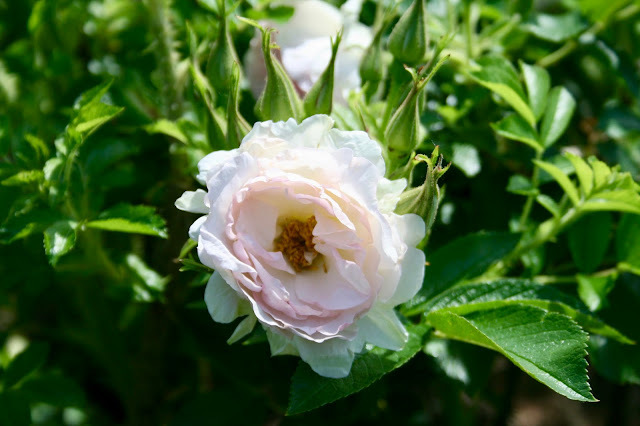 Even though the roses weren't big or in full bloom yet, they still had a lot of beautiful flowers! There was also a small pond garden in the Idea Garden. 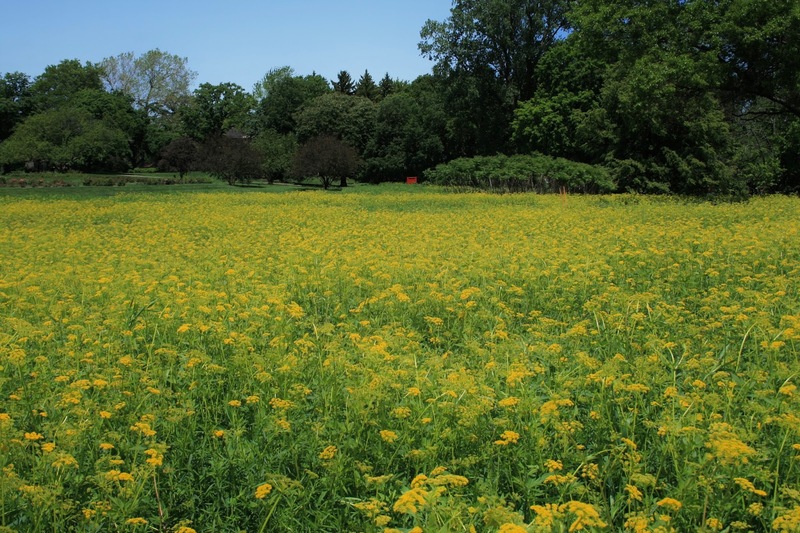 A yellow flower was in bloom in the Prairie Garden when we were there. Isn't it gorgeous? I wish I could grow a prairie garden in my yard, but every time I try it just ends up getting filled with weeds! I love this! So low maintenance and so pretty! 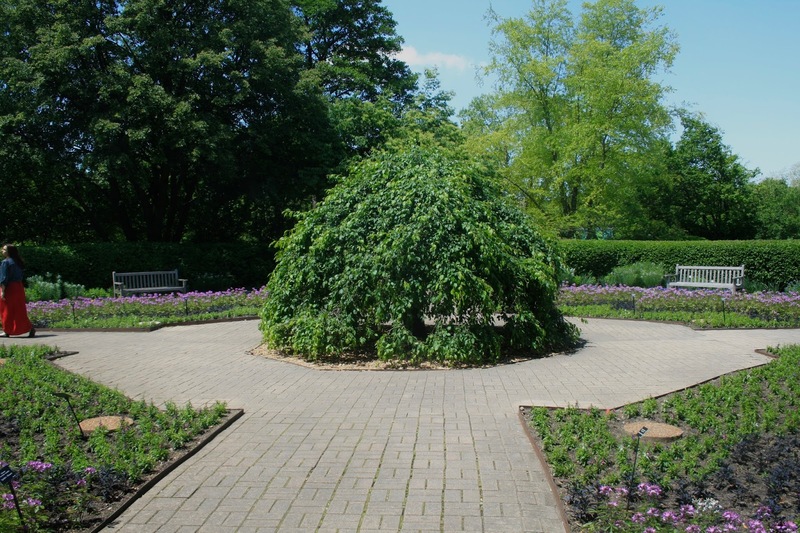 This is the Octagon Garden. At the center of this eight sided garden is a Weeping Crab Apple. This garden changes with the seasons. Spring brings 7,500 spring bulbs, summer brings annuals, and in the fall mums and kale are the stars of the show! 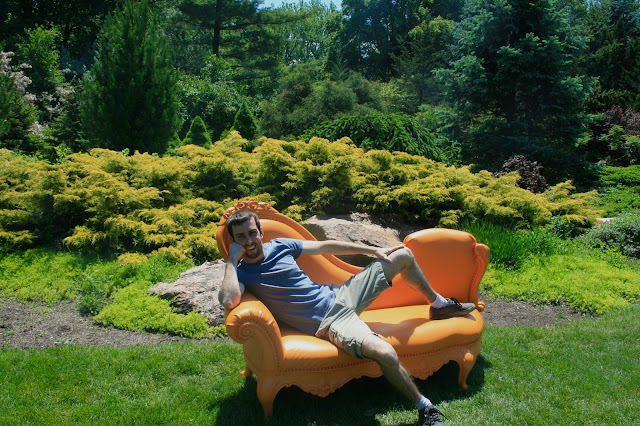 Throughout the gardens were scattered these fun indoor/outdoor furniture pieces. Yes, they are meant to sit on! Their bright colors and fun shapes really added a lot of fun interest to the gardens. Behind the "couch" is the Dry land Garden. There was a fun interactive fountain in the Formal Gardens that the kids loved to play in. The Visitor's Center can be seen in the background. 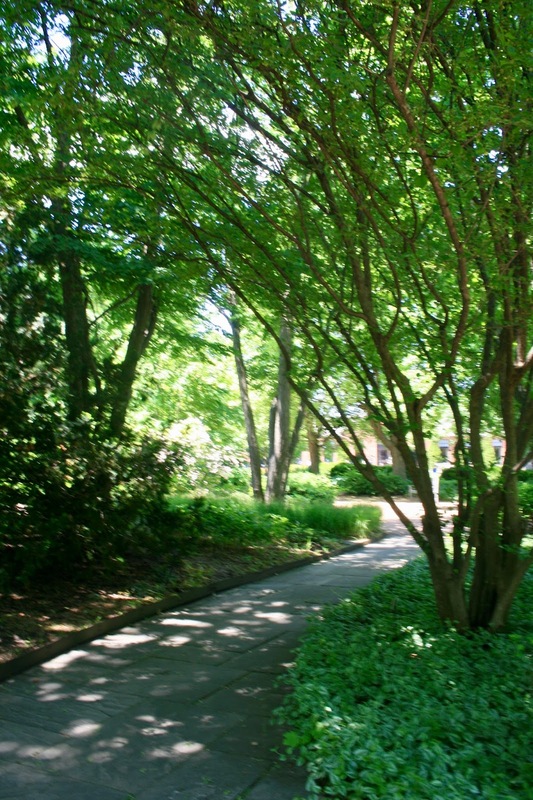 My favorite gardens were the shady paths. I enjoyed the solitude and the shelter from the sun. It also reminded me of my own woodland garden back home. 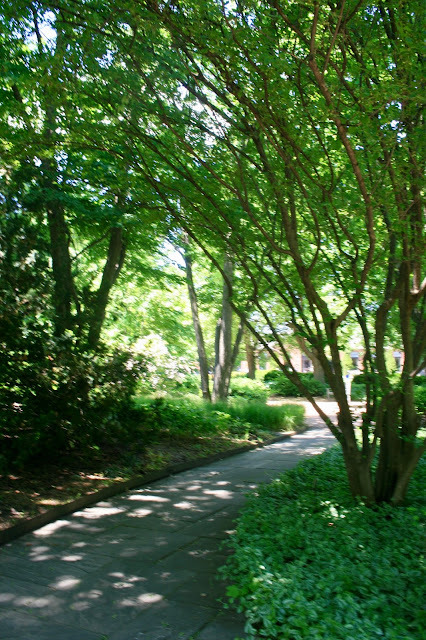 These gardens were filled with a variety of shade loving plants and bushes and a large assortment of trees. There were always plenty of places to sit and relax throughout the gardens. And thank goodness, cause there was a lot to see so it felt good to sit and rest awhile! 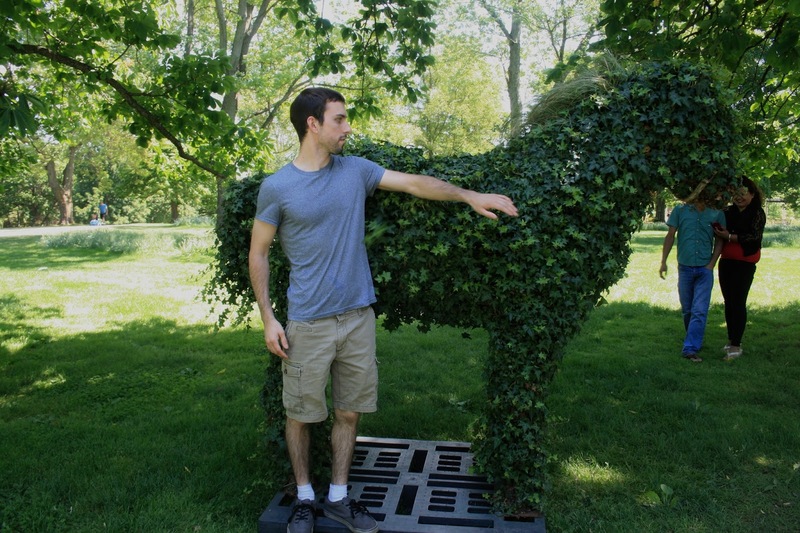 We discovered this horse topiary in front of the mansion. I had my son stand next to it to give you an idea of the scale. Isn't it amazing? This is the view outside of the mansion. It's located on the side of the mansion, and you walk down this massive series of stairs to reach it (pictured in second picture above). After spending a hour taking the mansion tour and a couple of hours walking the gardens we were exhausted and hungry. Although there is a restaurant located on the property we had all agreed we had seen everything that was open in the park so we decided to leave and get some lunch elsewhere. I said to my husband, "I know it was disappointing that the war museum and tank park weren't open, but I don't think we would have had the time or the stamina to see everything in one day anyway!" So we felt better about our visit to Cantigny after that realization. The First Division Museum (i.e. war museum) is scheduled to re-open August 26 2017. Other parts of the park will still be closed and not open to the public for five years as they are under-going a revitalization project. I said to my family, "Ok, let's remember on Alethea's fifth birthday to come and visit this park again!" We all laughed as that seems an eternity away! Hi Amy, this park is truly beautiful. I love all the greenery and how natural it looks. Truly a magical place. Thank you, it was a surprise to all of us how much was in this park and how pretty it was. I'm so jealous of all your travels, Amy! Your pictures are gorgeous and I enjoyed reading about your patriotic trip! Thanks Laura. We don't take any exotic trips, but we do have fun! What a lovely trip, gorgeous ground to tour!! Hope you will visit often! Wow so gorgeous! Sounds like such a fun day! You guys do the funnest things Amy!! I'm glad you stayed and showed us around!! Thanks Jodie! We like to find interesting things to do! Sorry the museums your husband wanted to see were closed, but that's great you still went and had a nice time. Lovely photos. Yeah, it was a bummer, but we still got to see a lot anyway. Thanks for visiting! On Summer Break To Visit My Granddaughter!